Hōkūleʻa is a Hawaiian voyaging canoe in the midst of a multi-year voyage around the world. (We wrote about her previously here.) Launched in 1975, the double-hulled vessel is 62 feet LOA, with a beam of 20 feet and draft of 3 feet. 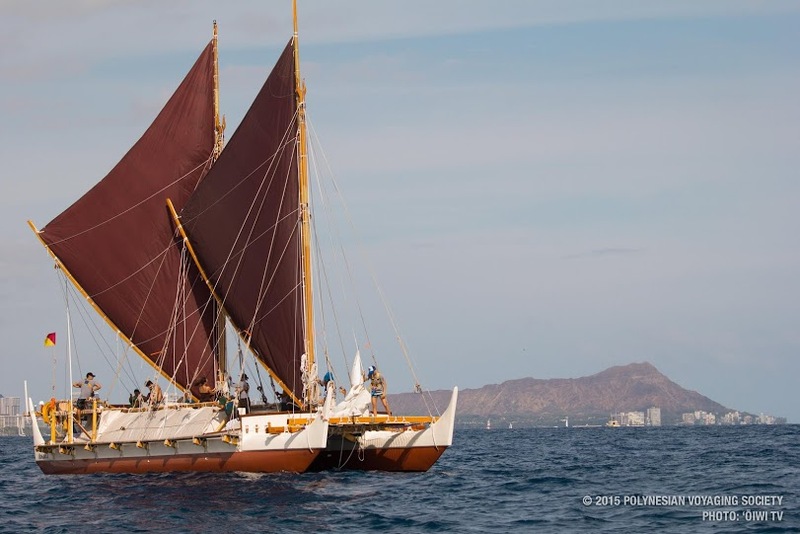 Her hulls are cold molded, but she is considered to be a "performance-accurate" reproduction of the canoes that are thought to have been used by Polynesians to settle much of the Pacific, including Hawaii. Built originally to test theories about Polynesian seafaring techniques and technology, she has since become an ambassador of Polynesian culture and a campaigner for environmental awareness. There's plenty about the vessel, her mission, and her circumnavigation on the website of her owner, the Polynesian Voyaging Society. The blade of the main steering sweep raised from the water. Lashings between one of the main cross-beams and one of the hulls. The boat is entirely lashed together. There are no mechanical fasteners. Hokule'a carries two idols on the vertical projections at the stern. On the port side (the female side of the boat) is a female figure. On the starboard or male side of the boat is a male figure. Where the female figure has prominent eyes and can see, the male is blind. But he holds a disc that represents the wisdom of the ancestors. Between the two of them, they have the perception and knowledge to guide Hokule'a safely. Kaleo Wong sitting atop the starboard berth enclosure. There are five or six berths on top of each hull, all in a line, under a narrow sloped tarpaulin "roof," with tarpaulin covers over the entry side as well. Kaleo's feet rest on the starboard steering sweep, which is not steerable: it can only be lowered or raised to change the boat's center of resistance. The main (center) steering sweep, looking aft. Another look at the main steering sweep, showing the lashings that hold it in place and serve as its pivot. NOTE: We're obliged to Sym (5) and Ars Sonor for free use of the nice ambient music we used for the intro and outro of the video.